​​OAKLAND, California - With the NBA assessing a flagrant 1 foul against Draymond Green for his antics with LeBron James in Game 4 of the NBA Finals, Green has earned himself a suspension for tonight's Game 5 in Oakland. The flagrant call gives Green his fourth flagrant foul point these playoffs, warranting the one game suspension. After watching the Golden State Warriors outwit, outmaneuver, and basically just outplay the Cleveland Cavaliers in three of the four Finals games thus far, the Cavs were all but dead and buried. That was until now. Until the NBA ruled that Draymond Green cannot play tonight, leaving the Warriors without not only their best defender, but without their best all around player. The flagrant assessment could not have come at a worse time for Golden State, and could not have come at a better time for Cleveland. Heading into Game 5, back home at Oracle Arena, the Warriors were flying high, ready to wrap up the series, capture their second straight title, and solidify their place among the all-time greatest teams. This monkey wrench has flipped the proverbial script on the series, and may have Golden State back on their heels tonight, instead of the Cavs. Hear me out. Game 5 was supposed to be a celebratory scrimmage for the Warriors, a preamble to the parade that was sure to follow. The Cavs faced the daunting task of attempting to cause Golden State to lose three straight games, something the Warriors had not done this entire - historic - season. It was over. The Warriors knew it. The fans knew it. Hell, even LeBron knew it. The Cavaliers would show up tonight in Oakland, they would go through the motions - maybe take a lead or two throughout the game - but in the end, the Dubs would finish them off like the champions that they are, prevailing into the record books. Instead, Golden State in now preparing to play the game without one of their floor leaders, one of the engines behind their 73 wins this season, and one of the reasons why they have a commanding 3-1 lead in this series. So far in the Finals, Draymond Green is playing 38.0 minutes per games, and averaging 14.8 ppg, 9.3 rpg, 5.6 apg, 1.8 spg, and 1.3 bpg. 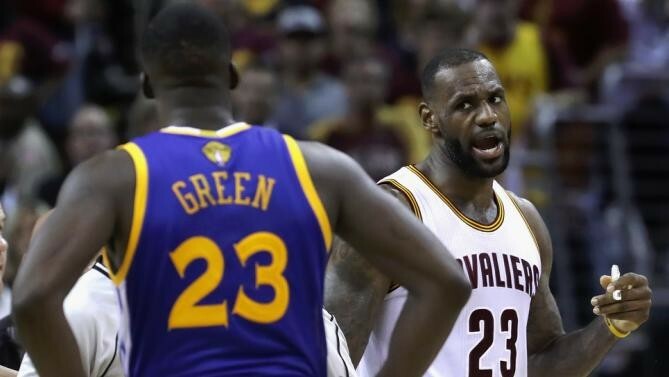 More importantly, Green has controlled LeBron James from establishing any type of meaningful presence thus far in the series. That is partly due to LeBron's passive nature through the first four games, but it is also due to Green's defensive pressure and his ability to guard LeBron on the perimeter, the drive, and the block. Losing Green for an entire game is somewhat foreign territory for Coach Steve Kerr and the Warriors. Green missed only one game this past season, which was a 112-110 loss to the Denver Nuggets in a game in which Danilo Gallinari, presumably whom Green would have defended much of the game, went for 28 points. In his absence tonight, Kerr will most likely go with Andre Iguodala, who has been terrific these playoffs and who is an excellent defender in his own right. So while no momentous step back there, Iguodala is not half of the offensive player or facilitator that Green is. In a series wherein neither Stephen Curry not Klay Thompson have looked like their normal selves, removing a piece like Green from the rotation could have fantastic ramifications. Without Green, Kerr will not have the ability to go with the Warriors' "Death Lineup" - Golden State's trademark small ball rotation wherein Draymond Green plays and defends the center position. Additionally, Green's absence will be sure to cause extended minutes for Andrew Bogut, and perhaps Anderson Verajao, as Coach Tyronn Lue and the Cavs will try to go big for long stretches as the Warriors will be without their most versatile defender. The most crucial aspect of tonight night's game for the Cavs, however, will be whether or not they return to being aggressive across the board on offense, and attack the rim early in Game 5, which they did effectively in Game 3, and which just so happens to be Cleveland's only win in this series. An early onslaught of meaningful drives to the basket - especially in Green's absence - will set the tone for the remainder of the game for the Cavs and open up the 15-18 foot jump shot later in the game, just as it did in Game 3. The Cavaliers will also need to continue with the defensive intensity that we saw from them in Game 3 and for about 39:00 minutes of Game 4. No matter whom Coach Steve Kerr decides to play in his forward's place tonight, the Warriors will not be be as good offensively as they normally are when they have Green on the floor. 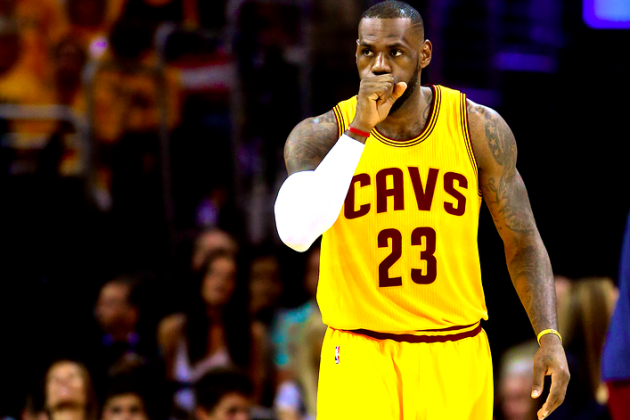 However, that does not mean that the Cavs can relax and focus primarily on only two players. Remember Game 1? The Cavs' defensive scheme tonight will need to be just as concentrated as if the Warriors were full strength. Tonight's game has transformed from an afterthought into an all out war. A win by the Warriors obviously ends the series. A win by the Cavs, however, shifts the momentum, at least partly, back to Cleveland as the Cavs will then be heading home down only 3-2 for a pivotal Game 6, with a chance to then even the series in front of their home crowd. With their season on the line, there is no chance that the Cavs are thinking that far ahead, but that is the reality of the situation, and both teams are subconsciously aware of that. The last thing that the Warriors want is for this series to be extended any further than it needs to be. But with the suspension of Draymond Green, we now may just have to wait a minute before handing out that trophy.